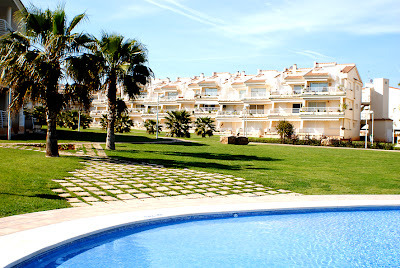 Welcome to our holiday spot, Alcalablau, a modern three-storey apartment complex completed in 2004. The complex has lifts in each of its four blocks, and has walkways at the back of each block for access to each floor. All ground floor apartments have large terraces with stairs leading down to the extensive lawn and garden area. Top-floor apartments have a second level with a roof terrace, some with loft extensions. All apartments have a covered carpark in the parking area behind each residential block. There are two car entrances at Alcalablau; one at the back of the complex behind block I and one on the north side between blocks I and IV. Alcalablau boasts two large swimming pools joined by an overflow and waterslide. The lower pool is deep and the pool on the higher level is wide with the deeper end near the overflow flattening out to a shallow end for the younger children. There is also a separate toddlers’ pool for the tiny ones. During the summer the pools are attended by a life guard from 11am to 3pm and from 5 pm to 8 pm. Thatched parasols on well-kept lawns surround the pool, providing shade from the summer sun. Palm trees and jacarandahs add further shade on the manicured lawns. There are showers for use by all owners and guests/tenants around the pool area, as well as inside the front gates at the beach entrance. High speed WiFi was installed throughout the complex in 2012. This system has a pay-per-user code entry with prices varying from €15 for one month basic speed access to €4 for two days. Codes are available at the corner shop "Crisdan"
Alcalablau is situated only metres away from the sandy Playa del Moro, a family-friendly 170-metre long beach nestled between craggy cliffs and rockpools. The beach is 33 metres wide and boasts fine Dorada-type sand. The waves are invariably subdued making Playa del Moro a particularly popular beach for children. Lifeguards are on duty at Playa del Moro during the Summer months, there are showers for removing sand before returning to the apartment, and paper- and garbage bins are placed around the beach. These are emptied each morning. The beach is raked and cleaned each evening during the Summer. 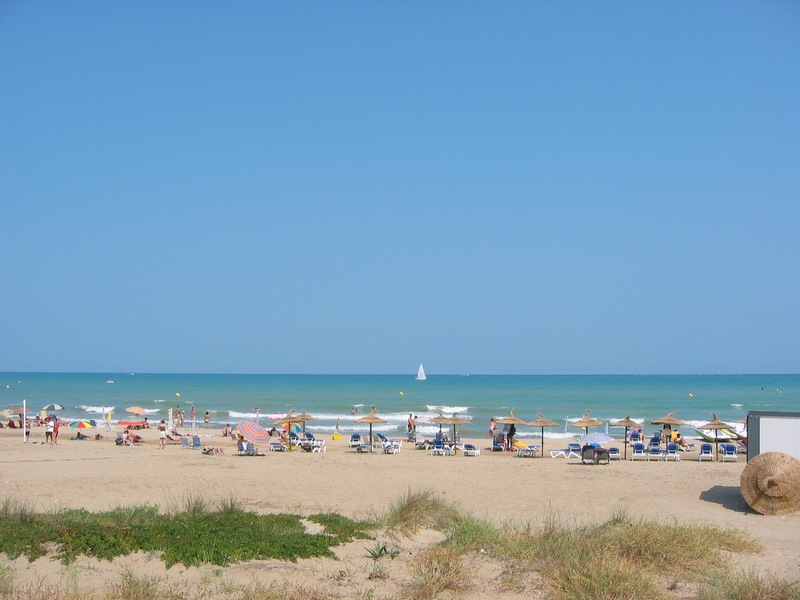 Playa del Moro was awarded the EC blue flag in 2013 for purity of water and cleanliness of the beach. Sand dunes and coastal vegetation are preserved to the south between Playa del Moro and Tres Playas. A nature walk, built in 2009, winds its way between the coastal vegetation and dunes to the south and to the north along the beach road to Playa Romana. From here there is a boardwalk which leads along the beaches Romana and Carregador until it connects with the promenade in the centre of the village. This promenade hosts the many colourful sidewalk cafés, restaurants, tapas spots and ice cream bars. In the immediate vicinity of Alcalablau, there are restaurants, bars, pizzerias, shops, hotels, bike rental centres, beaches, boardwalks, pools, parasols, sun and pearly sands enough to satisfy the most demanding holidaymaker.